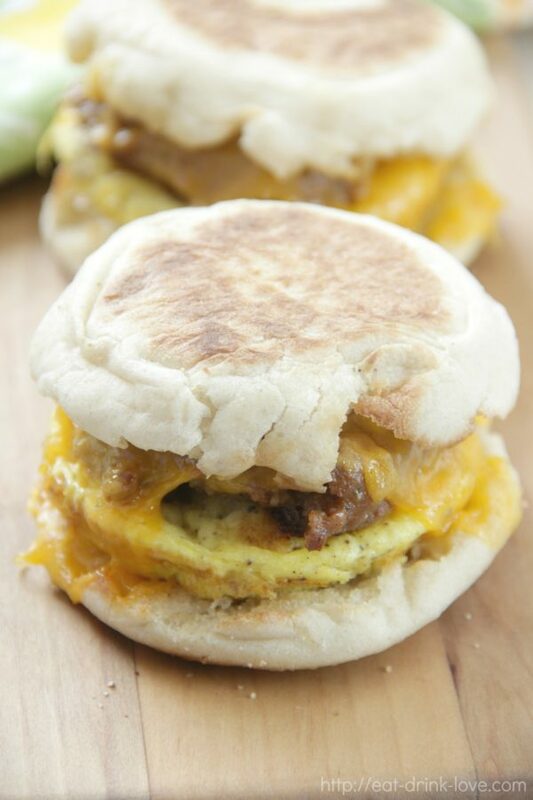 Freezer Breakfast Sandwiches - Eat. Drink. Love. Hi All. I’m sorry I didn’t get a new post up last week. Sadly, we had a death in the family as we lost my uncle. I was obviously a bit distracted, but am trying to get back to work. I can’t believe it’s already August! And now that August has arrived, it’s already time for the kiddos to start heading back to school over the next few weeks. Craziness! Weekday mornings can be a bit chaotic with trying to get everyone up, dressed, and out the door. 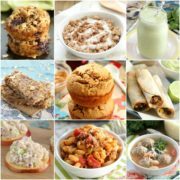 Even for me with a baby and toddler, my husband and I need quick breakfast ideas and these freezer breakfast sandwiches are totally the answer! 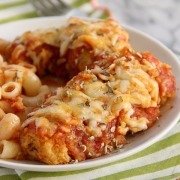 All you have to do is heat them up in the microwave and in a couple of minutes, you are on your way! I’ve been making batches of these sandwiches for the last few months and my husband just adores them. I’ve tried them with sausage patties (the version I’m posting today), bacon, or veggies, and they are all delish! My husband loves the sausage version so we will stick with that one today! For this recipe, I use ground Italian sausage (or pork sausage). For the eggs, I bake them in a whoopie pie pan or a muffin tin and they are the perfect size and shape for stuffing inside an english muffin. If sausage isn’t your thing, you can use bacon or your favorite veggies. You can also do a little bit of both to keep things more interesting throughout the week! 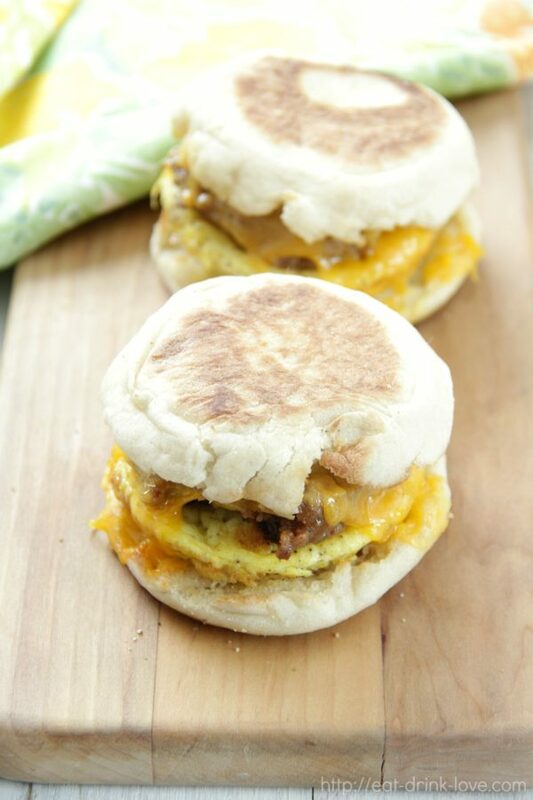 These simple make-ahead and freeze breakfast sandwiches make for the perfect grab and go breakfast! 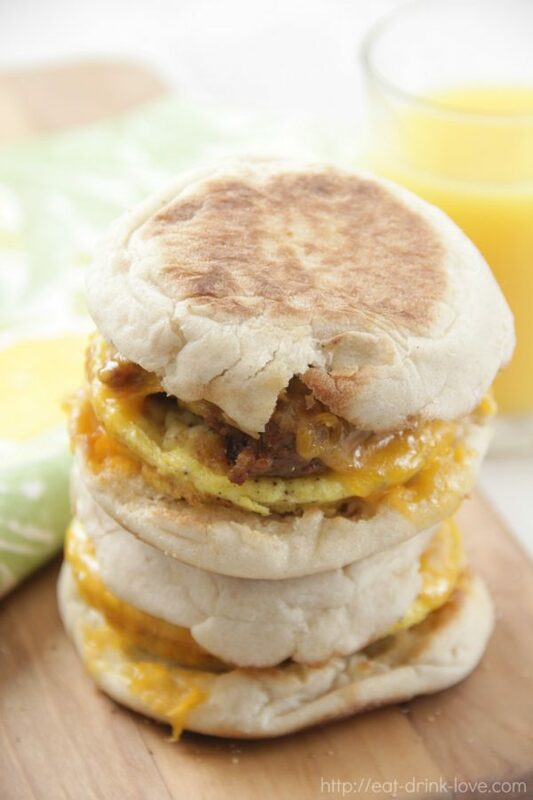 Toasted English muffins stuffed with baked eggs, sausage patties, and melted cheese! Divide and form the sausage into 6 equal patties. Cook the patties in a saute pan over medium heat (about 4 minutes per side). Set aside. While the patties cook, whisk together the eggs in a bowl. Stir in the salt and pepper. Spray the cavities of a muffin tin (or whoopie pie pan) with non-stick spray. Divide the egg mixture amongst 6 cavities. Bake for about 10 minutes or until the eggs are set and lightly golden. Once the eggs are done baking, switch oven to broil. Spread some butter on each half of the English muffins and arrange in a single layer on a cookie sheet. Place under the broiler until lightly toasted, about 3-5 minutes. Remove from the oven. 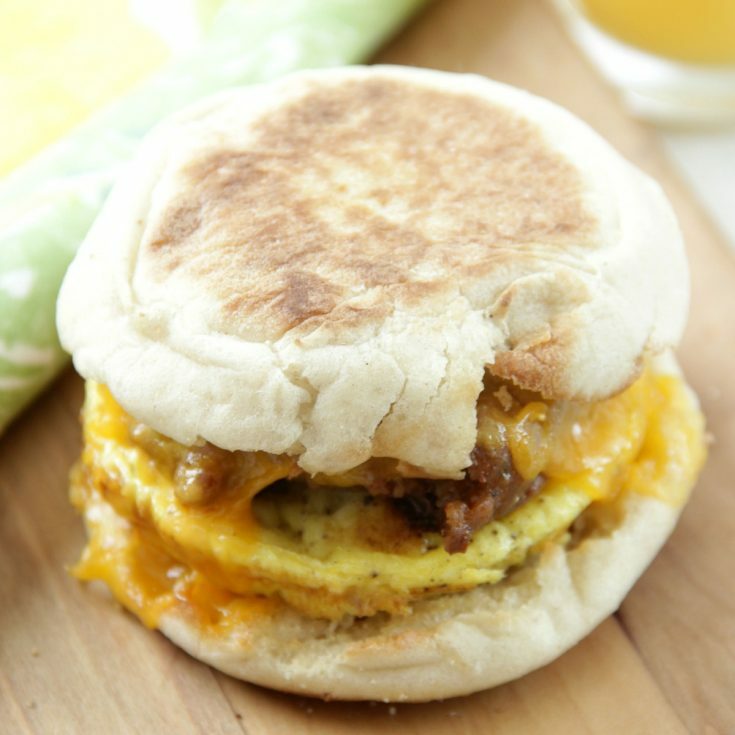 To assemble the sandwiches, place a cooked sausage patty on the bottom half of the English muffins, followed by the egg, and the cheese. 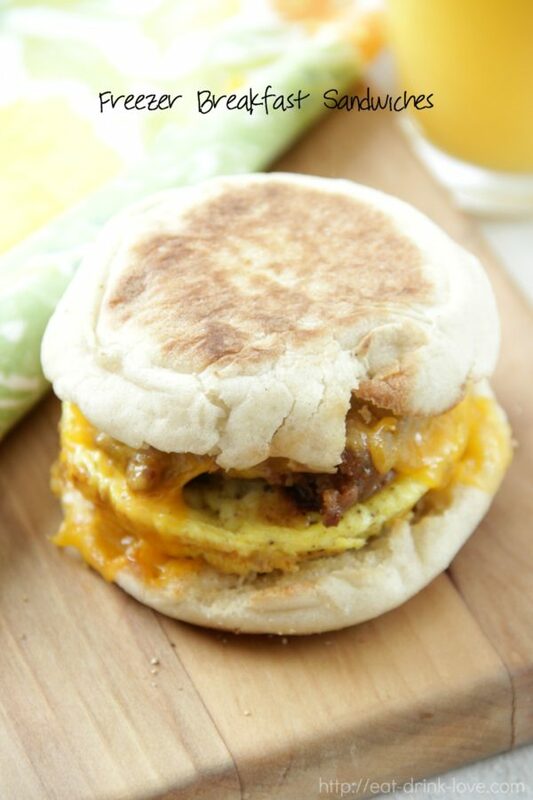 Replace the top half of the English muffin back on top. Wrap in foil and freeze in a large freezer bag. To reheat the sandwiches - Remove from the foil. Wrap the entire sandwich in a damp paper towel. Heat in the microwave for about 2 minutes or until the sandwich has heated thoroughly. Let stand for about 2-5 minutes. Serve. 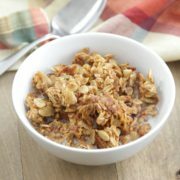 Looking for more make-ahead breakfast ideas? Try these! Cannot get enough of this page!! These sammies are the perfect breakfast to have on hand. Love!